HÀ NỘI — Việt Nam is one of Asia’s five worst polluters of ocean plastic waste, according to international organisations. With 13 million tonnes of waste released to the ocean every year, the country ranks 17th in the world for ocean plastic waste pollution. Numbers from Việt Nam’s Association of Plastic illustrate the scale of the problem. In 1990, each Vietnamese consumed 3.8kg of plastic per year, but 25 years later, the figure hit 41kg. As many as 1,000 plastic bags are used each minute but only 27 per cent of them are treated and recycled. The Ministry of Natural Resources and Environment (MONRE) estimated that about 80 tonnes of plastic waste and bags are thrown away every day in Hà Nội and HCM City combined. On the positive side, Việt Nam has taken efforts to manage imported plastic scrap and monitor plastic production and consumption. 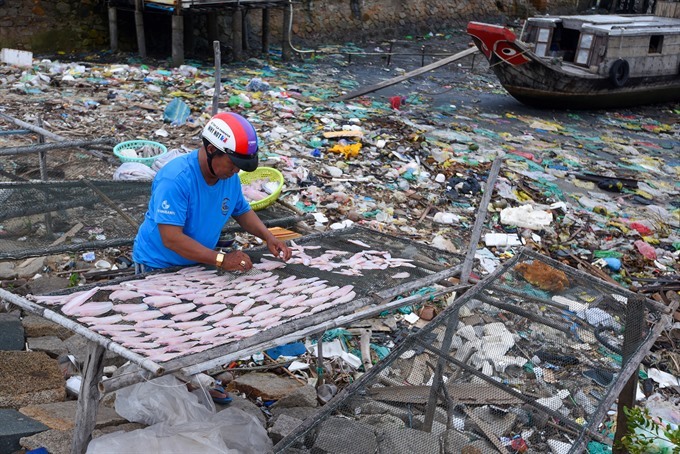 Director General of the sea and islands administration, Tạ Đình Thi, said in 2018, Việt Nam proposed Partnerships in Environmental Management for the Seas of East Asia and launched initiatives to foster global co-operation in plastic waste reduction. A campaign launched by MONRE last year delivers the message that single actions are not enough to address plastic pollution but a series of actions like plastic recycling, saying no to single plastic use and seeking alternative energy solutions can help. Nguyễn Thế Tuấn, head of Việt Nam Administration of Seas and Islands, said the first priority was to review legal documents related to plastic waste’s risk management to complete legal framework on Việt Nam’s ocean plastic waste combined with environmentally-friendly ocean growth strategy. As 80 per cent of plastic waste comes from the mainland, management on plastic production and consumption is of importance, according to experts. Việt Nam is trying to make changes, starting with changing public behaviour. Nguyễn Thượng Hiền, head of solid waste management department of MONRE’s Việt Nam Environmental Administration said that MONRE aimed to reduce 65 per cent of non-biodegradable plastic bags used at supermarkets and shopping malls by 2020 compare to 2010. By 2026, Việt Nam targets zero non-biodegradable plastic bags. The majority of solid waste in Việt Nam is treated by burning or dumped in landfills. However, these methods are said to have low environmental and economic values because landfills cause land pollution while burning emits toxic air. According to Minister of Natural Resources and Environment Trần Hồng Hà, Việt Nam has studied methods to apply technology in making environmentally-friendly materials from waste. “Technology application to limit landfills and take advantage of values from waste is an urgent task,” he said. Việt Nam has recently succeeded in turning waste to energy or organic carbon – a compound used to improve soil and applied in organic agriculture. The energy generated from waste has been used for the national grid in HCM City. The organic carbon soil has been certified to have higher nutrition levels than cow and chicken manure, even two times higher than organic bio-fertiliser. Nguyễn Gia Long, director of Hydraulic Machine Ltd Company and waste-to-energy inventor in Việt Nam said the technology could be applied in the community and follows global green energy trend and has low investment in device and equipment and helps cut spending on hiring staff thanks to automation.